A recent study covered in this USA Today Article discovered that people who read literary fiction as opposed to pop fiction become more perceptive, especially in regards to relating with other people. I think the study’s findings make sense. My experiences in my own reading life certainly confirm them. These findings are important for everyone, but especially to parents, because our challenge is two-fold. 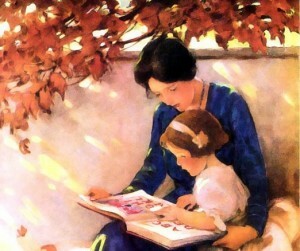 We need to read good literary fiction so that we can relate to people (including children!) well, and we need to give our children literature for whatever their age level is that will teach them empathy, help them form perceptive thoughts, and broaden their ideas. There’s nothing wrong with picking up some purely fun books for yourself or your children, but I challenge you to balance those choices with books that pull the imagination and senses and emotions in all at the same time. I hope you’ve found some books in this 31 Days of Picture Books that fit that bill. More picture books to come tomorrow!